Market Moroccan© turns to Gold. Home/Morocco/Market Moroccan© turns to Gold. Over the summer months they have been charred on charcoal, stuffed, peeled or mashed. One week saw them thinly sliced and sautéed, then sandwiched with delicate local cheese and piled high, as the chefs at Palais Amani, created a vertiginous savoury mille-feuille. They have been blended with sesame, marinated with coriander or sautéed with basil: But now as the evenings draw in, Eggplant is on the way out! Morocco is blessed with rich soil, a steady water supply and generous amounts of sunshine. The perfect combination for produce in abundance. And in the ancient city of Fez, the souks and markets literally overflow. They overflow with locally gown fruit and vegetables, following the seasons, just as they should do. Palais Amani is an impeccably restored palace converted into boutique hotel. 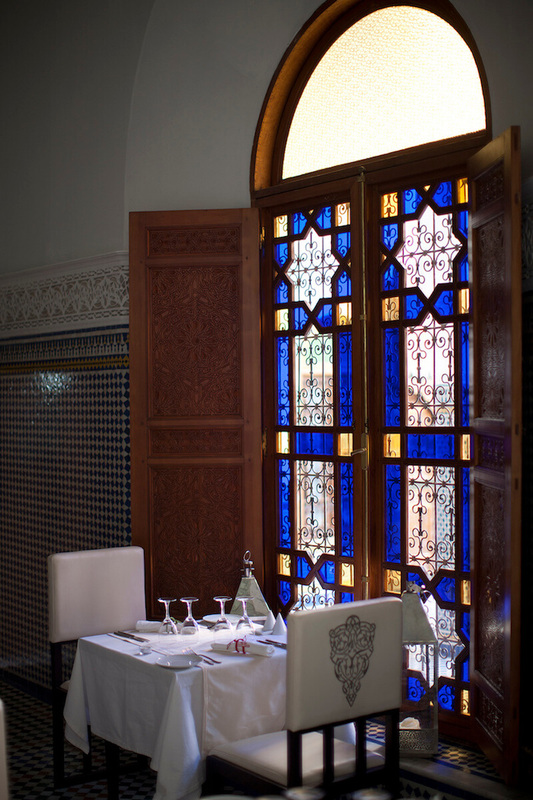 It’s also home to Eden its gastronomic restaurant and sits just inside the walls of Fez’s ancient city. To the joy of our chefs all these souks and markets are literally on our doorstep. Market Moroccan© is a relatively new concept at Eden, Palais Amani’s restaurant in Fez. It was born from a desire to offer a healthier choice of food to our guests, and from the wish to create and experiment with what is out there for us to enjoy. Chef Houssam begins writing his menu on his daily shopping trip. In his mind’s eye the combination of textures, flavours and colours translate into dishes that he experiments. Once perfected, that finish on the following week’s menu. As the new season gets underway, Eden’s weekly Market Moroccan Menu is turning as golden as the mulberry trees in the gardens of Jnane Sbil. With cartloads of berries filling the markets of late, Houssam Laassari has created exciting dishes for Eden’s menu. So far this season we have had a creamy homemade ice cream flavoured with the jujube nut. Similar to a hazel in flavour this ice cream has enticed clients who usually stop before dessert. Houssam’s moist chocolate cake with the brilliant red fruit of the Arbusier bush has made a killing this week in the restaurant. Pumpkin, earthy brown on the outside and flaming orange on the inside has been served as a creamy soup with almonds. Or served in a golden roasted vegetable couscous. Next week is going to feature once more in a rich risotto with pumpkin and chestnuts.